However, even the most magical marketing automation software has its limitations. Let’s take a closer look at some marketing must-haves that you need to improve the effectiveness of your marketing automation software and round-out your B2B marketing efforts. Even if your choice MAP has a built-in CMS, the actual execution of your content marketing strategy can be difficult. The process of creating and managing content requires a number of steps that can’t be executed using only marketing automation. Every content strategy starts with content ideas – although these can be formulated by generating insights from your MAP (e.g., digging through contact data, determining which content drove the most leads), the ideas need to ultimately be rooted in your buyer personas, which requires extensive research outside of your contact database. Turning these ideas into content requires a dozen moving parts that also can’t be automated: writing, editing, designing, outsourcing, and so on. Plus, once your digital content is published, it can be difficult to manage and organize on a traditional CMS. If you’re using a CMS within your MAP, the function is ultimately to keep your content and demand gen efforts linked. This isn’t to say that content should exist separately from marketing automation – in fact, we’re trying to prove the opposite. You need content in order to actually execute campaigns, generate inbound leads, implement robust lead scoring, and guide the path to purchase. However, this starts with creating and effectively managing a supply of valuable, relevant, and consistent content, and that isn’t something that can be automated. Marketing automation is usually owned by an organization's lead generation team. When you really think about it, however, your marketing automation platform isn’t the best tool for generating new leads. “Not true!”, you might be thinking. “That’s what landing pages are for.” Sure, most MAPs allow for easy landing page building, and yes, these can be used to generate new contacts. However, it should be your content and outbound campaigns that are pulling in traffic that will actually convert on these landing pages (which is why it’s so important to have a well-optimized content experience – more on that below). Marketing automation shines when it’s used for nurturing leads that are procured via content marketing, events, campaigns, etc. Although it includes lead generation components, it can’t act as an effective tool for lead generation alone. If you’re going through a marketing automation tool to build out your entire content experience, you may run into some roadblocks. It’s hard to find a tool that will be completely neutral regarding the tools it allows you to integrate with. Say you want to create a form to collect signups for your newsletter that you send through an email platform outside of your MAP. Chances are, this is going to be a no-no. Since your MAP already has the ability to send emails, they’re probably not going to be so keen on you sending them out of a different party. Likewise, many MAPs will only offer their own tools, not letting you plug into a different type of content (e.g. your MAP may not have a way to host videos so get used to having them live outside of your other content). You might read this heading and be like, “What you talkin’ ‘bout, Willis? Automation is in the name of a marketing automation tool!”. And yes, many functions are automated within a MAP, but they’re pretty much only related to your campaigns – not your content. Building out a content experience through a MAP will be a pretty manual process. Since few tools have integrations where they automatically pull in feeds from other sources (e.g. for social posts or content curation), you’ll have to bring in anything you want to publish. No tool can function without humans, and ideally those humans are part of a well-synchronized demand gen and content team. Possibly the number one area where marketing automation tools fall flat is in the content experience. They have lead nurturing down to a science and even some of their blogging tools are pretty rad, but when you try to pull everything in together, the magic starts to fizzle out. Creating a logical path from one piece of content to the next can be difficult with a MAP. Most of them only offer landing pages to gate premium content so this makes the journey from a “free” piece to a gated piece pretty clunky. Say you’re reading a wonderful blog post and you want to click through to a recommended eBook. You’ll probably be pushed out from the blog to a separate landing page where you’re forced to download a PDF. You’re totally removed from the experience you were just in and even if you read the eBook, you’re out of the resource center where you found it and, chances are, you won’t return. Marketing automation software is awesome. We rely on it heavily here at Uberflip. But it can’t do it all – it requires an effective team and a robust content strategy (supported by a well-optimized content experience) in order to really work its magic. How do you get more value out of your marketing automation tool(s)? Tell us in the comments! 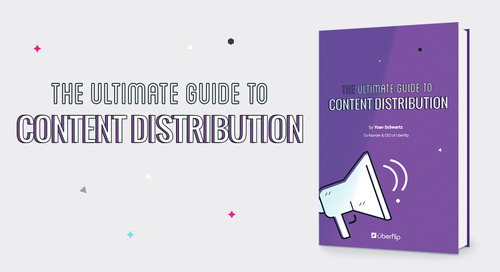 Learn more about building the perfect content experience in our eBook.